SUBCOE EnerDRIVE Low Harmonic drive systems are designed to function in accordance with the IEEE519 input power quality guidelines and when specified with true sinewave output power waveforms. There are three SUBCOE Low Harmonic Drive input configuration options that can then be specified with an optional filtered output. We manufacture low harmonic systems and control products for the global markets. Our advanced control and power solutions are available for all environments, voltages and frequencies. Our EnerDRIVE MATRIX drives use a patented fully active, regenerative, Matrix IGBT configuration, which has an inherently low harmonic impact on the connected supply power system. With over 650 systems installed and reliably operating in SUBCOE NEMA4 Desert enclosures at temperatures up to 55 degC we have a level of experience that is not common in the industry. The Matrix VFD topography has direct connection of the input and output power systems to efficiently transfer power in both directions, this drive package is extensively used for cyclic loads such as beam pumps where there is power demand and regeneration in each of the pump cycles. 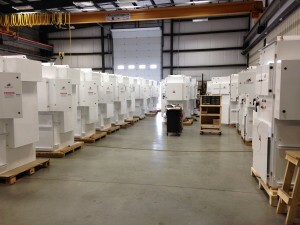 Systems are available up to 414A continuous capacity. The EnerDRIVE with 12 pulse front end and 5% Line Reactors is our most popular large drive product, it meets the second tier of IEEE519 guidelines which is suitable for most large power distribution systems. SUBCOE 18P & 24P systems are fully IEEE519 compliant with the strictest standards. All systems have incoming power line phases have individual protective circuit breakers for protection against input phase loss and may be fitted with optional input line reactors that are tuned to further reduce harmonics and to balance rectifier section loading. 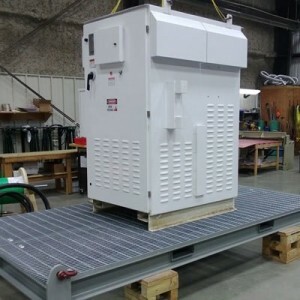 SUBCOE designed skid systems integrate special 12/18/24P phase shifting Stepdown transformers and Stepup transformers into the VFD system. In extremely sensitive areas the we can provide specially designed systems that offer enhanced harmonics cancellation. In certain global markets there is a preference for VFD with a single (6 Pulse) incoming rectifier section and a dedicated IEE519 L-L-C filter on the incoming power system. This option is most commonly used in retrofit applications where a 12P power supply is not available or when wells are being added to a field and a pre-existing 3 phase power system must be used. We have a complete range of IEEE filters available in integrated and stand alone configurations.